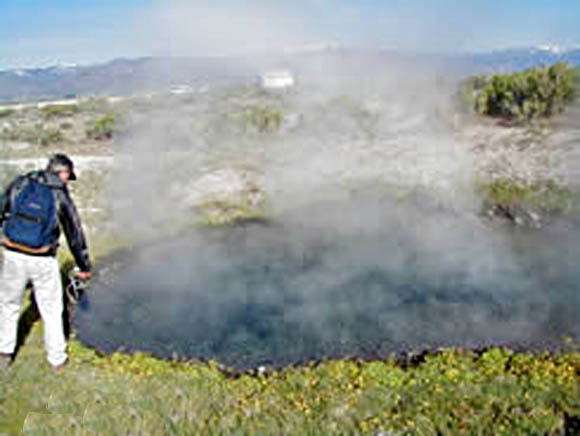 Geothermal spring localities may be significant to identifying and understanding site-specific flora and fauna: certain plant and animal species are endemic to geothermal spring areas and may impact the management of the area. Warm water (less than 150°C) from geothermal springs and wells is currently being used for a variety of applications, including space heating, agriculture, aquaculture, and recreation as well as providing an economic impact on the local areas. Digital data included in this GIS include geothermal site name, state, county, site type, latitude and longitude, water temperature (° C), depth of well (m), flow rate (lpm), and pH. Water chemistry was not included in this GIS product due to time constraints in releasing a product for the ICBEMP. There is a total of 6,155 records in this GIS with each record representing a single sample from one collection point. More than one record may exist for a site due to multiple sampling over time; however, the states generally selected one sample record to best represent a single site for their compilation. The geothermal spring and well maps for the ICBEMP study area show locations of geothermal springs and wells in the Pacific Northwest with low to moderate water temperatures (less than 150° C), in addition to a few representative sites indicating the presence of hotter thermal waters. Generally, sites were included in the states' data sets if the water temperature ranged from at least 10&3176; C above the mean annual surface temperature up to an upper limit of 150° C. Known Geothermal Resource Areas (KGRAs), areas designated as having the potential to generate electricity from high- or moderate-temperature geothermal waters, are not delineated in this report. Compressed (geotempnw.e00.Z) Arc/Info Export format (1.2 MB uncompressed). As a zip file (geotempnw.e00.zip) Arc/Info Export format (1.2 MB uncompressed). Needed to re-create the paper map in a GIS. This file is in UNIX compressed tar format (more_datasets.tar.Z) and includes 4 coverages in Arc/Info Export format that includes rivers within the study area, study area boundaries, state boundaries within the study area, and 1:2M lat/long corner tics (4.5 MB uncompressed). Needed to re-create the paper maps in a GIS. This file is in UNIX compressed tar format (plot-aml.tar.Z) and includes 7 ASCII files, Arc/Info plot AMLs, key files, and explanatorytext (25 kb uncompressed). Maps prepared from the digital dataset, in compressed tar (maps.tar.Z) HPGL2 format: (1.6 MB uncompressed HPGL2). The map scale is 1:2,000,000. Sheet size is approximately 29 by 38 inches. The maps are oriented with the long axis in the x-direction for plotting. These maps (spring2m.hp and well2m.hp) were designed to be plotted on a HP Inkjet Plotter (model 650-C), but can be plotted on any full-color (inkjet or electrostatic) plotter which will accept HPGL2 code. Johnson, B.R., Derkey, P.D., 1995, Digital maps of low- to moderate-temperature geothermal springs and wells in the Pacific Northwest; a contribution to the Interior Columbia basin ecosystem management project: U. S. Geological Survey Open-File Report 1995-689, 15 p,.